Crystal Fanatics….Want some Swarovski Chocolate Candy? Swarovski Chocolate? Well, not exactly. 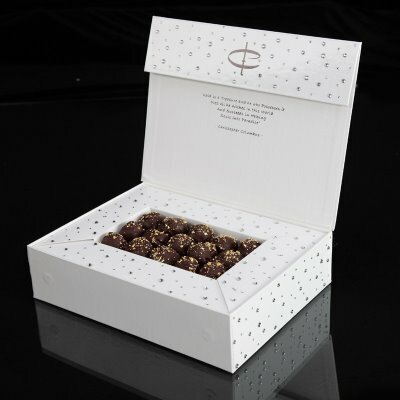 It is luxury chocolate with Swarovski crystal embellishments on the box. Chocaholics and crystal fanatics alike are going to have to pay out a small fortune to purchase this unique gift. The history of this gift? “The Chocolate” company spent two years perfecting this wonderful blend of chocolate, of 63% black chocolate. Champagne is also used in the recipe, which is kept top-secret. The mixture is used to produce the “champagne truffles”. Topping the luxury chocolate truffles is edible 24-carat gold flakes. (With the cost of gold these days, I’m not so sure I’d eat the flakes as I cannot imagine they have value-added flavor, despite the claim that is does). Keeping the extravagance theme in mind, the box is just as lavish. There are two different boxes available to package your chocolate in. The “Boutique Box” (full size box) is decorated with 450 Swarovski crystals on the inside and outside. Box + chocolate = nearly $300. Each of the Boutique Boxes is said to be numbered and include a certificate according to one source. “The Chocolate” indicates that the Boutique Box is also a collector’s item. I guess this is one Swarovski box that you would not want to discard! The “Bambina Box” (for a single large truffle) is decorated with 200 Swarovski crystals on the inside and outside. Box + chocolate = nearly $80. The luxurious chocolate truffles can be purchased directly from “The Chocolate” web site. 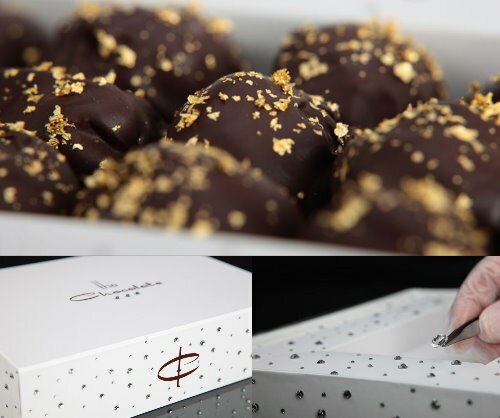 “The Chocolate” indicates that your truffles are made shortly after orders are placed and that a signature is required for deliver of these special Swarovski-boxed truffles. Very interesting, however, I think I’ll stick to the Hershey kisses for my chocolate fixes and save my money for genuine Swarovski crystal figurines!